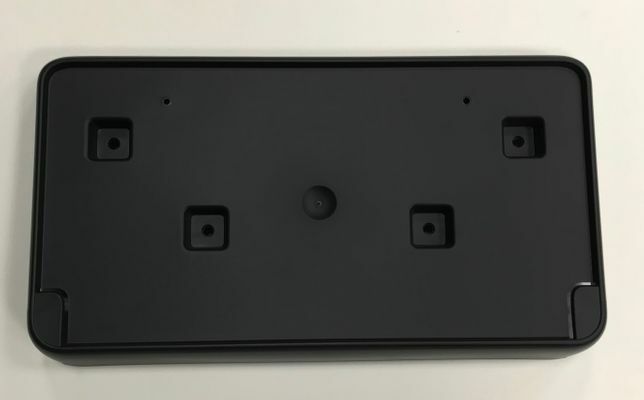 Mopar factory Front License PLate Bracket for the 2016*-2018 WK2 Grand Cherokee models. Please select the bracket you need above. Fit perfect on my 2017 Jeep Grand Cherokee and was easy to install. This fits my 2016 Jeep Grand Cherokee 75th Anniversary Edition perfectly. Perfect fit on 2019 Jeep Grand Cherokee Limited. Needed a front license plate bracket for 2018 Grand Cherokee Trailhawk. This is a Mopar part and fit perfectly. Just what I needed. Fits perfectly, comes complete with screws, easy to install. ProsPerfect fit, easy to install, factory Mopar item. I purchased a 2017 Grand Cherokee used. It didn�€™t come with the front plate frame. This fits perfectly. Perfect Fit For 2017 Overland! This license plate holder is the perfect fit for the Jeep bumper! Originally bought a plate holder from Auto Zone and when I went to put it on, would have had to drill new holes and it would have just flopped around and scratched the bumper. Ordered this holder, came in the mail fast, and went on like it was built for it. These should come standard when you buy the vehicle. Will def order from here again! ConsThe screws that come with it are a crazy star shape head. May be difficult for people who don't have that screw bit. My license plate holder was cracked and it was nice I could purchase another one exactly like it on Just for Jeeps! Glad I found this piece. Fit great with the stock body molding. Hardware was high quality. Looks neat and clean - Easy work to install. I was skeptical as to how a front license plate would look after coming from a state that didn't require it. I was actually dreading putting it on my new Jeep. Actually, it turned out very well. The bracket was indeed custom and fit perfectly. And I think it actually looks good. Sometimes when you see the term "custom" it turns out not to be so. This actually was. I'm happy with it. I was also told by my Jeep dealer there was no bracket available. This fits perfect, and installation was easy. Fast shipping and great service! Thanks! I wen to my Jeep Dealer and they told me there wasn't a front license plate bracket for my 2017 Jeep Grand Cherokee. Found it online at JustforJeeps.com and it fits perfectly! Item is perfect. Fits just as stated.